for yourself on the world's leading digitally-adjusted putting and full swing platform. Zen Golf Mechanics putting classes. the slopes, from subtle to extreme. Experience a new level of learning, compared to flat-surface indoor golf. and more are affected by the slopes which you encounter every day as a golfer. Improve in a gaming environment. Take on the 20 Most Famous Putts From The Majors. Involve friends and other loved ones. Compete in challenges which Green Stage sets you, and set your own challenges. you're a golfer all right - first timer, or veteran. You're playing the game for real. Create and practice any makeable putt on the planet on the Zen Green Stage. Experience the true reality of the scoring zone – and say goodbye to unrealistic flat-surface putting. It’s the same for the full swing. How many completely flat lies do you get on a golf course? 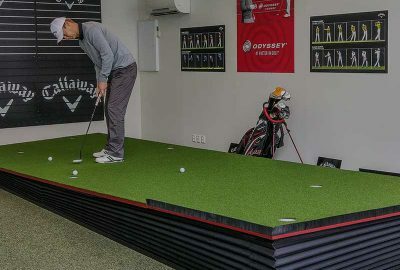 Improve your long game by hitting from the Zen Green Stage – compatible with golf simulators for indoor use, and ideal as a hitting surface on a covered outdoor driving range. Take the Zen Ryder Cup Putting Masterclass! Below is a selection of videos from our YouTube Channel. "Zen Green Stage offers the golfer and coach a totally different experience. Playing on it is memorable, you talk to people about it afterwards, and it has given us a strong unique selling point. It makes us stand out from other golf retailers, and it has been a decisive factor in our continued success." "The Zen Green Stage allows us to create any type of makeable putt on the planet. 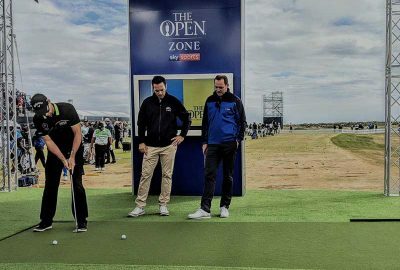 It has been a big step forward for us, and putting the Zen Green Stage into our studio was a great decision"
Zen Golf is a UK-based specialist golf equipment manufacturer, and inventor of the ground-breaking putting coaching system known as Zen Putting Mechanics™. Based in the city of Sheffield, one of Europe’s technology and industry powerhouses, we aim to develop original technology which progresses the sport of golf, makes it more enjoyable, improves performance, and helps to grow participation levels. Our founder, Nick Middleton, is a Tour golf putting coach, creator of the revolutionary Zen Oracle putter, and also co-creator of the Zen Green Stage. We are continuously developing new aspects of our technology. Contact us on +44 (0) 7971 403627 / info@zenoracle.com to discuss how to update your experience, or to get product support. Behind the scenes at the Masters Tournament! Zen Green Stage all set up with the incredible Zen Eye feature! Learning golf is one thing. Applying it is another. We would love to stay in touch with you, sign up for the Zen Oracle team to contact you with great news, content and offers.